Since the release of the critically acclaimed album Enki, Ashmedi – the founder of Jerusalem-based metal icons MELECHESH – has been engaged in a new adventure. This time, not as a producer, but as a protagonist of an epic, interactive graphic novel featuring MELECHESH and the Sumerian myths. Emerging comic book and graphic novel company Metal Depot – whose mission it is to envisage the lyrics, life, and music of the bands they love and turn them into exciting visual stories – have been tirelessly working alongside Ashmedi on the creation of this book since summer 2016. Now, the 130-page epic is ready to unleash the wrath of awoken gods, bringing mayhem on the land of mortals. The graphic novel, entitled Emissary of the Anunnaki: The Tale of the Fire King, will be released on July 1, 2018. What makes Emissary of the Anunnaki: The Tale of the Fire King even more unique is its interactive online version, located at www.md-comics.com, that will allow readers to have a direct impact on the story and help the characters make choices in different situations. The online version will pose challenges to the reader – meaning certain pages will only be unlocked with the solving of said challenges. Certain pages will allow you to choose how characters progress, and some will even allow you to become that character and take part in battles! An audio version of the book will also be available, where the readers can hear the dialogues – even featuring our protagonist himself, Ashmedi – the representatives of different generations of rock and metal musicians in Armenia, and professional actors as the secondary characters. Last week, Metal Depot revealed the first official teaser of the graphic novel via www.md-comics.com. Subscription is open now for those who want to be informed as soon as the epic book is released. 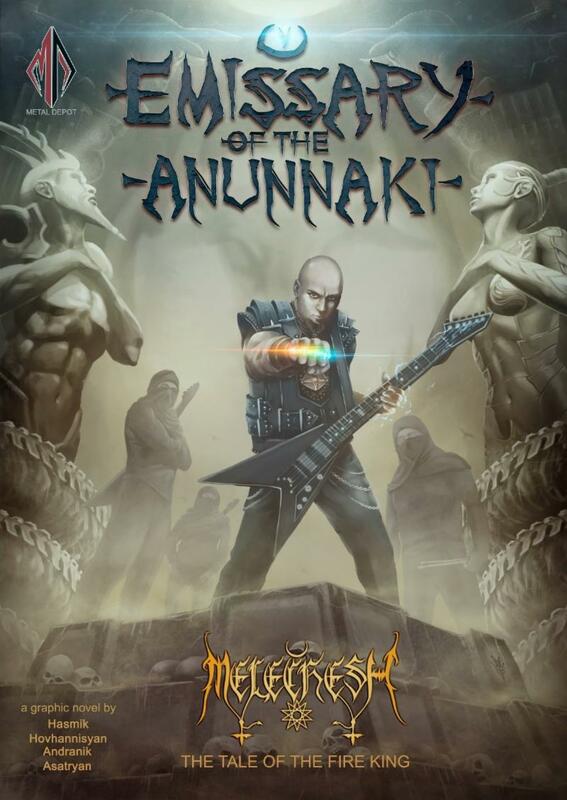 Pre-orders are available now through the official Emissary of the Anunnaki: The Tale of the Fire King Kickstarter crowdfunding campaign with early-bird rates and limited edition of special merchandise. Visit the Kickstarter page here.